Between our regular grocery list and trips to the farmers market, we ended up with too many potatoes in the house. An obvious solution – make some potato chips. Sure, it’s faster to buy a bag of Kettle brand chips from the store, but they never taste as fresh and you’re limited to the standard seasonings and flavors. Making your own potato chips allows you to choose the type of oil. While I used the canola oil we have on hand, I considered tracking down some California Rice Oil Company oil, after recently reading in Cook’s Illustrated that the smoke point is much higher than canola or peanut oil. You can also use seasoned salts like truffle salt or fennel salt to subtly enhance your potato chip flavor. 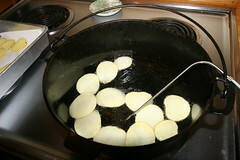 A two-staged frying process was used to achieve a crisp golden brown chip. 1) Heat oil in cast iron pan, with thermometer in oil to make sure temperature reaches 300 degrees. 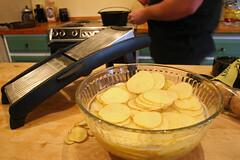 2) As oil heats, clean your potatoes and slice with mandolin slicer set to approximately 2mm. Place sliced potatoes in a bowl of water to keep them from turning brown. 3) Remove slices from water and pat dry on paper towels, place enough slices in oil to have one layer covering the surface of the oil. 4) Allow slices to blanch, cooking until they turn from a shiny color to a more matte appearance. Remove from oil with a slotted spoon and place in a pan lined with paper towels to absorb excess oil. 5) After blanching all potato slices, increase the temperature of the oil to between 350-375 degrees. 6) Repeat process of layering chips in the oil, this time cooking them until they turn a golden color (or until crisp with purple or blue potato slices). 7) Remove from oil and place on paper towels to absorb excess oil, season with your favorite salt while still hot.